When asked to think of a snarky, borderline mean Twitter account, you wouldn't be alone if you thought of Wendy's. They're out there sniping at people almost every day of the year. If that's news to you, don't try to make sense of it. Customers have come to love the chain for its scathing social media personality. Competitors try to imitate its ability to be treated like a real person instead of a faceless corporation. However, Wendy's does it well. It's a funny account. So, it more or less makes sense that Wendy's would dedicate an entire day to the cause of burning strangers on the internet. That's what it did on the entirely made up National Roast Day on January 4. The company spent the entire day asking people to volunteer for a savage roasting. Naturally, people lined up like someone was giving out free cronuts. The responses were often hilarious. Though, it's also telling that many of the accounts lining up for a good dressing down were other companies. But, whatever. Some of the burns were excellent, and that's the reason for the season. Here are some of Wendy's best burns in honor of National Roast Day. I'll let you know when we see one. 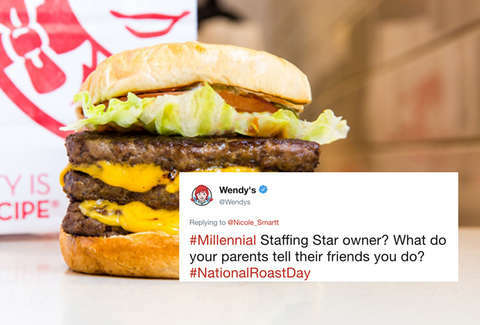 If you feel your life would be improved through ridicule from the social media manager of a fast food chain, you missed your chance to get in on National Roast Day. However, Wendy's is always up for launching barbs. You'll get your chance.